“People really don’t understand the gravity of the drought, particularly in urban California, where people are hundreds of miles from their water source,” said Felicia Marcus, chairwoman of the State Water Resources Control Board, which voted on Tuesday to impose the new regulations. They are expected to take effect around Aug. 1. While none of the state’s 10 hydraulic regions have conserved as much as the governor asked for, most cut back at least 5 percent in May. The biggest exception is the South Coast region, which includes the Los Angeles and San Diego areas, as well as Orange County. There, water use increased 8 percent over previous years. After a lengthy hearing on Tuesday, the water control board imposed a series of mandatory restrictions on the use of potable water that will limit outdoor watering to two days a week, largely prohibit washing sidewalks and driveways, and ban washing cars without a shut-off nozzle on the hose. Violations may be punished with fines of up to $500 per day. The drought has already pummeled farmers in California, which is home to the nation’s largest agricultural sector. So far this year, about a third less water than usual has been available to the state’s farmers, according to a report released Tuesday by the Center for Watershed Sciences at the University of California, Davis. The report projected that the drought would cost about $2.2 billion in statewide revenue this year, and that 17,100 farm-related jobs would be lost. 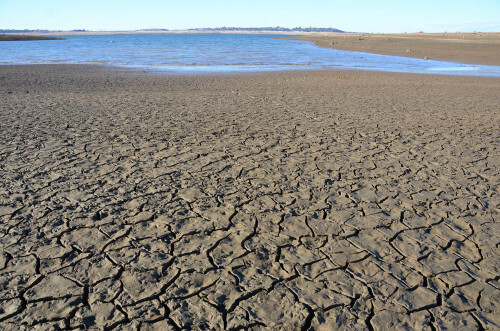 The report projected that the drought would continue through 2015, even if this fall brings El Niño conditions, which sometimes lead to heavy rainfall. Before the vote on Tuesday, only about 30 percent of the water suppliers in the state had imposed mandatory restrictions. Now, various kinds of outdoor water use — like fountains that use potable water that is not recirculated — will be banned outright. Officials estimate that half of residential water use in the state is outside the home. And if the new measures fail to produce results, Ms. Marcus said, even stricter restrictions on outdoor water use could be adopted. Some water suppliers complained that the new rules would unfairly hit residents who had already worked hard to cut back. Agriculture accounts for about 75 percent of water use in California, but the board’s regulations target use by urban Californians. Lisa Brown, the water efficiency administrator for Roseville, Calif., echoed his concerns. She said that during a less severe drought in 2009, her city had issued hundreds of tickets to people wasting water and found that it was not an effective strategy. Glad they are doing something but I take it the old water rights contract holders are still allowed to guzzle as much as they want? Nowhere is the information available about which days you can water. I have seedlings out that will die without water every 2 days or more. Too soon to know; each water district will set its own rules and timetables. Goes into effect on August 1. I think water consumption increased because people have already cut back. They have already installed low flow toilets. They already turn the water off when they brush their teeth. Those who will have already installed low water use landscapes. When was the last time you saw anyone washing a car with a hose not fitted with a shut off mechanism? But in years of drought, one must water landscapes, especially trees, to keep them alive. Does that increase in water consumption only include urban users? Or is that including farmers as well? There are some crops which just should not be farmed in California. Like rice, for example. Yet, California is a major rice producer. I’d also like to see the end of golf courses in dry areas, but that’s just me. I think those golf courses are a tremendous waste of space, water and energy for just a few people who want to play a kind of silly game. You bet. For several years San Diego City code has specified you can only wash cars with a hose with an automatic shut off. I haven’t seen anyone hosing off a sidewalk in years, but I did used to quickly hose off bird droppings from my patio after dry sweeping it first. Thats a good sanitary practice. I can’t help but feel this is the typical thing we get from elected officials- gestures to make it appear they are addressing an issue that would take real vision and political risk to finally solve. In this case probably a national aqueduct/pipeline system the scale of the national highway system, to transfer water from areas with excess rainfall to areas in drought. Some of our land is the most fertile on earth, it would pay for itself in reduced lost agriculture and probably open up more for growing after irrigation. I scanned today’s U-T article on this and could not find the 8% figure – the amount of water usage that has increased since January in So Cal. I guess I’m the only one wondering why it was such a good idea for the county board of supervisors to squander *FIVE MILLION* of our tax dollars, on that new “FREE” water park, downtown. True, it’s supposed to be “recycled” water however, it still has to be replaced due to evaporation. I noticed there’s a huge grass lawn which obviously needs to be watered, too. This also meant the elimination of the parking lot and it’s my understanding that there will soon be a rate increase on the existing parking. Hard to take a drought seriously, when you see such shenanigans…plus the fact that when we decrease the use of water, it’s NOT reflected on our bills. Nope….you are not the only one wondering. If we really cared about conservation, we would force water agencies to bill by the gallon or the liter, rather than 100 cubic feet (748 gallons!) at a time. By using such a huge unit of measure and always rounding up, water agencies are able to charge an effective price for water of 150% of the stated rate. But this “trick” to increase their revenue and rip off their customers also means that almost no combination of conservation measures will lower your water bill. So if you are using 1.6 HCF a month, and you take drastic measures to reduce your use by 25-30%, you will use 1.1 HCF, and your bill will be exactly the same. Which days am I allowed to water outside and what is the maximum length of time for me to water in each section of my yard? Are there any restrictions in the mandatory water restrictions in my home? I really want to know so I can apply the guidelines. Many thanks for an email response as soon as possible. Thank you I am grateful for your assistance. Yes, please let us know so that we can set up our automatic sprinkler systems to be in compliance with the newest restrictions. August 1 is right around the corner! I agree that golf courses are a huge waste of water. Our neighborhood parks have acres of dead grass while affluent golfers enjoy lush greens during this period of extreme drought. Why don’t they have to cut back on water usage? I also think that fines for water wasters are important for community morale. While most of us have sacrificed our lawns and plants to comply with water restrictions, there is always a neighbor or two who flaunts the law, watering their marshy yards daily and allowing hundreds of gallons of water to gush into the street gutters. It is difficult to see such behavior go unpunished. I can’t imagine that happening too often with the cost of water, at least not intentionally. If i had a significant faucet leak the property manager was all over me as soon as he got the next bill. What you’re suggesting is a stiff penalty for people throwing away money. The act is costly enough and most of those you’d punish would be accidental mistakes.